I decided to dig out my old tiara, which I last wore 10 years ago, and found it to be tarnished and dull. As it was a Sunday morning and I was still in my PJs, I was not about to run to the store to buy jewelry cleaner. Instead, I tried a couple of things and found a great solution to making my dull tiara look new again. We hope to add an exciting new collection of Tiaras to Classic Veils in the near future! 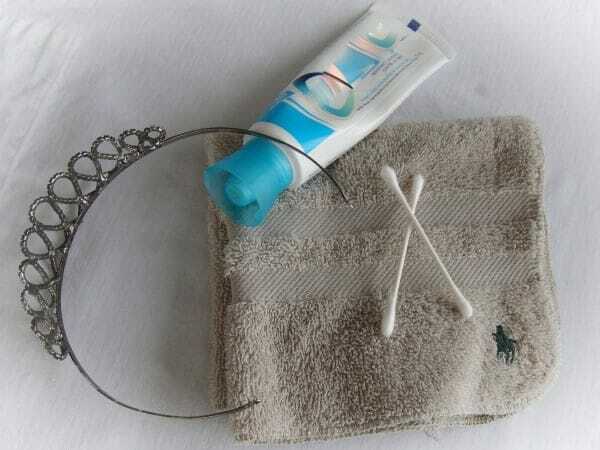 Apply the tooth paste (no water required) to the tiara using the cloth for larger areas, and a Q-tip for the harder to reach areas. You should instantly start to see the tarnish disappear. Polish or wipe the tiara. Rinse with water and repeat the process as required. Tarnished tiara starting to look new again! Too bad those aren’t real diamonds … Shh, don’t tell!